(well at least it is morning here in California). I have had to rush back to my room to bash out a few words to describe the pure bloody awesomeness that was this morning. Sailing into San Francisco, under the Golden Gate Bridge at dawn. It wasn’t until late last night that I decided that I wanted to be on deck for the experience. 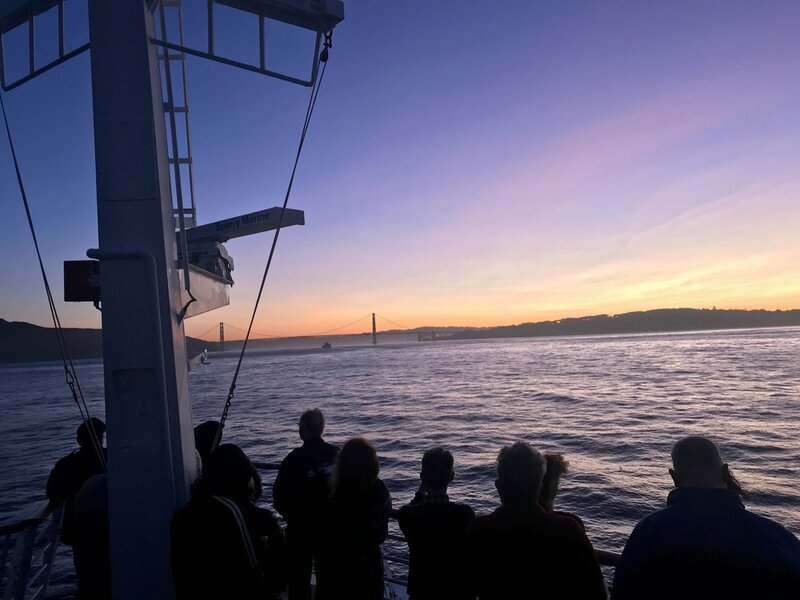 I mean it was just another sunrise at sea, but sunrise sailing under the Golden Gate bridge, you don’t do that everyday. So carpe diem or as the less classically inclined say “YOLO!” (ugggh). I set my alarm, and hit the hay (what’s the nautical expression for going to bed?). All too soon my dreams where interrupted with the mellow tones of Martin Denny’s Voodoo Dreams coming from my phone. Do I really want to get up on a cool Northern Californian morning, stand on the heli-deck with who knows how many early risers and watch the sunrise. Ok Ok Ok. I dragged my tired body out of bed and pulled on yesterday’s outfit and headed down to the deck to establish just where we were. A quick moment on deck told me two things, a) it was a bit chilly out there b) I had time to hit the cafe to grab a morning brew. So given that I had time, I naturally headed back to the cafe to purchase the very expensive brew and then headed to the heli-deck. The Golden Gate Bridge at dawn. An awesome way to start the day. The deck wasn’t as crowded as I thought it might be (or as it turned out should be). Less than 100 people had risen to take in the spectacle from this vantage point. I did notice that some of the guests in the forward suites had also risen (PSA to forward suite guests: please wear some clothes if you are going to stand in the window, or at least turn off the cabin lights. Some things just can’t be unseen). The upper decks also had their share of those seeking the dawns early rays. We slowly approached San Francisco Bay, the silhouette of the bridge slowly taking shape as the sun made its way over the horizon. Those earliest to the deck stood their ground, taking photos, while the few late arrivals, like myself, moved around the deck to find the best vantage point to take photos and videos. It was a beautiful sunrise, and the Golden Gate bridge is truely one of the worlds most beautiful bridges. But to be honest, it was just a beautiful moment. Hardly the best beautiful moment, or the most memorable until we were almost under the bridge. If you have ever cruised or watched a ship depart port, it announces it’s departure with a mighty blast of its horn, in some cases other ships will reply with blasts of theirs. It can all be quite stirring. When I crossed the Atlantic on the Serenade with the think fog pressing in on us, the horn sounded every few minutes which was just the way you would imagine such crossing. I have never been up early enough, or even in a position to hear if the horn sounds when it sails into a port before, so I am unsure whether the vessel always announces its arrival this way but this morning with a mighty, and one of the longest, bellows I have heard, the Explorer of the Seas announced our arrival into San Francisco Bay, the great bellow reverberated off the Golden Gate bridge and vibrated through our bodies. Everybody on deck was emotionally moved by that moment. With wows and ahhhs, that was cool, and my own comment, “that was bloody awesome!” The man next to me nodded in agreement. Another man lamented that his wife had decided to stay in bed. “She missed out” he said. And we are here. San Francisco.